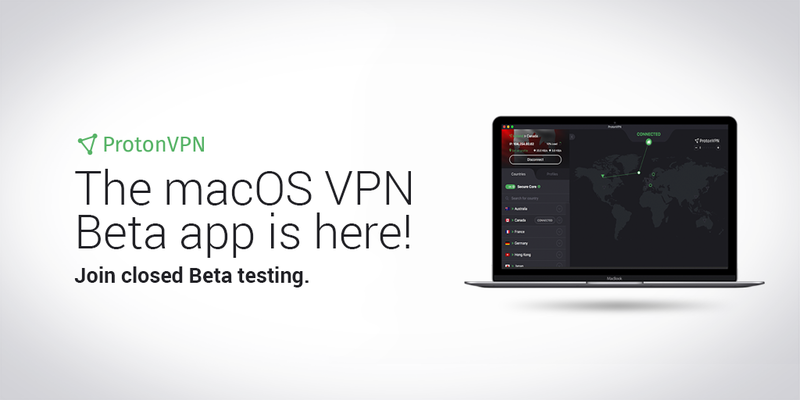 The ProtonVPN macOS Beta app is here! Posted on March 6th, 2018 by ProtonVPN Admin in Articles & News. We’re happy to announce that we’ve released the much-anticipated ProtonVPN macOS application into beta! As the number of ProtonVPN users has grown, so has the demand for a macOS VPN app. We’re pleased to welcome a growing community that supports our vision and has the same concerns about online safety and privacy. After much work over the past several months, we’re happy to finally make the ProtonVPN macOS beta application available to all paid ProtonVPN users. Your feedback is important because it will help to shape the subsequent development of the application. After login you will be able to download and install the macOS app and start testing. If you’re a ProtonVPN free user and want to participate in this program, you can do so by upgrading to any paid plan. Just login to your account and choose the plan that fits you the best. ProtonVPN’s macOS app contains several advantages over using an OpenVPN application like Tunnelblick. First, the macOS application uses the modern IKEv2 protocol which can sometimes allow for higher performance compared to OpenVPN. It also comes with a graphical user interface which automatically shows all available servers, and allows you to connect to any country with a single click using either the country listing or the map. It also allows you to create and save custom connection profiles, and also comes with a configurable VPN kill switch feature. If you have problems with the macOS application, you can also use ProtonVPN on your Mac using OpenVPN. Your feedback is important! You can report bugs or send us your opinion through our support form here. We look forward to working with the community to build the best macOS VPN application available! I’ve only been using the mac app a short while but the speed seems to vary a lot with occasional hangs. (US-East; mostly VA servers #3-4) I haven’t used a vpn commonly in the past so I am not sure what level of service I should be expecting. With that in mind, I do think that the app looks promising. Hello Rick, if you are experiencing any issues with the service, please contact our support team via https://protonvpn.com/support-form, they are always ready to help! So far it looks good. The only issue I’ve encountered so far is setting up a profile. I’m getting a message that says “Country and server combination needs to be unique”. I’m not sure what that means, but the profile options aren’t something I really need. So far, I’m happy with it. Hey Jason! This error means that you’ve already created a profile with the same country and server. Just simply select a different country or server and the issue won’t persist. This MacOS app won’t work at all. Can’t connect to any servers. It states; «connection time out» or just «disconnected» at no reason. This goes for the all of the servers incl securecore servers. Hello Frank, if the app is not working for you, please write us via mac-beta@protonvpn.com and our support team will help you out. Thanks so much for releasing the beta app! I’m VERY pleased, although I haven’t figured out how to have the kill switch actually work after the computer has been awaken after sleep. I expected the kill switch to block all traffic until I have connected to a protonvpn server, is that so or did I overlook something? All of the very best wishes to the Proton Team! Hello Peter! This issue has been fixed with the version 0.2.2 so please make sure that you have updated the app! When will it come for Linux and iOS? I am impatient! 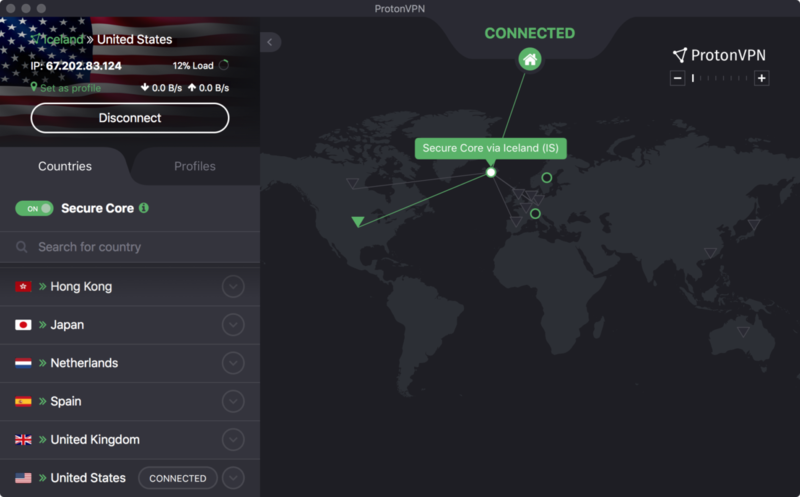 Hello Asi, please check out our client tool for Linux here: https://protonvpn.com/blog/linux-vpn-command-line-tool/. Our iOS app is currently in development. Hello, when do you plan on releasing a native ProtonVPN app for iOS devices? I would have thought you release one for iOS before Android. I have downloaded and installed the beta for Mac. I can launch the app but when trying to connect to a server I always got a pop-up window requesting my password. So I fill in my account password but nothing happens and get a message “connecting time out”. Try inputting the password you would use for the OpenVPN version through Tunnelblick. That’s the one mine accepted. This is a neagent prompt from macOS system in order for the app to access OpenVPN password from the Keychain- you have to enter your computer password there and select Always Allow. The prompt shouldn’t come up anymore for as long as the system is not restarted. If the password is not entered correctly twice in a row, then OpenVPN password is required to be entered in order to authorize the connection. I have the same situation here. I could get through the password popup by choosing “always allow”, but the connection is not established and I get the same error. I have reached ProtonVPN by the provided e-mail for beta testers, but I have not received a answer so far. Any news regarding this is deeply appreciated.